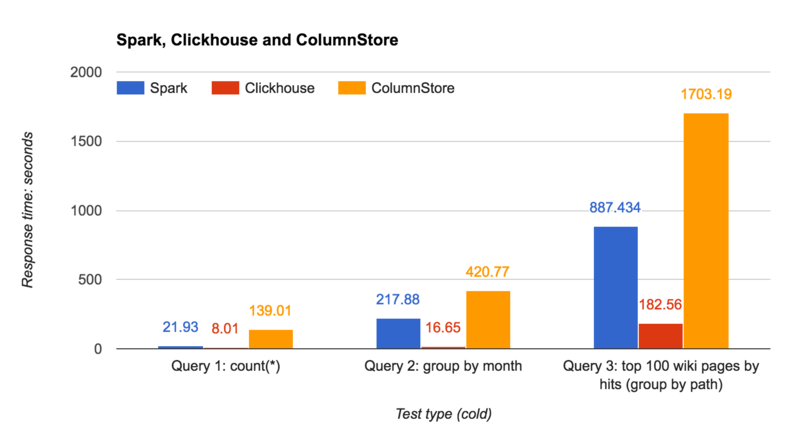 An in-depth comparison looking at the query performance of MariaDB ColumnStore, ClickHouse, and Apache Spark. 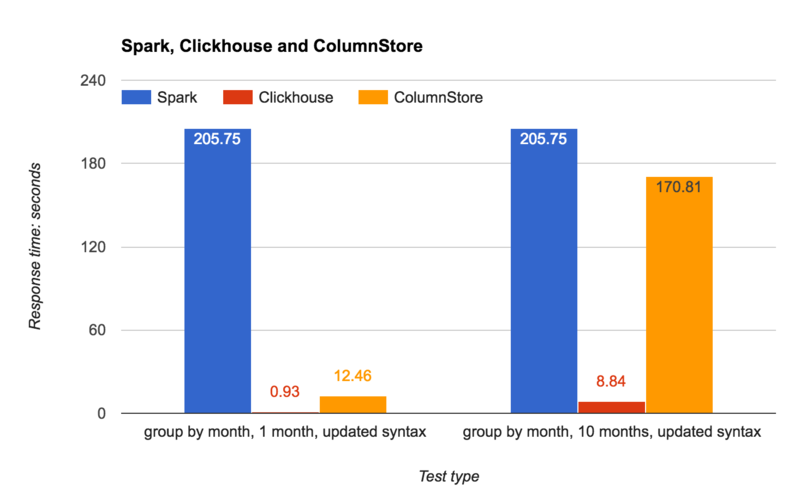 This blog shares some column store database benchmark results and compares the query performance of MariaDB ColumnStore v. 1.0.7 (based on InfiniDB), Clickhouse, and Apache Spark. The purpose of the benchmark is to see how these three solutions work on a single big server with many CPU cores and large amounts of RAM. Both systems are massively parallel (MPP) database systems, so they should use many cores for SELECT queries. Wikipedia page Counts, loaded full with the year 2008, ~26 billion rows. Query analytics data from Percona Monitoring and Management. This blog post shares the results for the Wikipedia page counts (same queries as for the ClickHouse benchmark). In the following posts, I will use other datasets to compare the performance. MariaDB ColumnStore v. 1.0.7, ColumnStore storage engine. Yandex ClickHouse v. 1.1.54164, MergeTree storage engine. 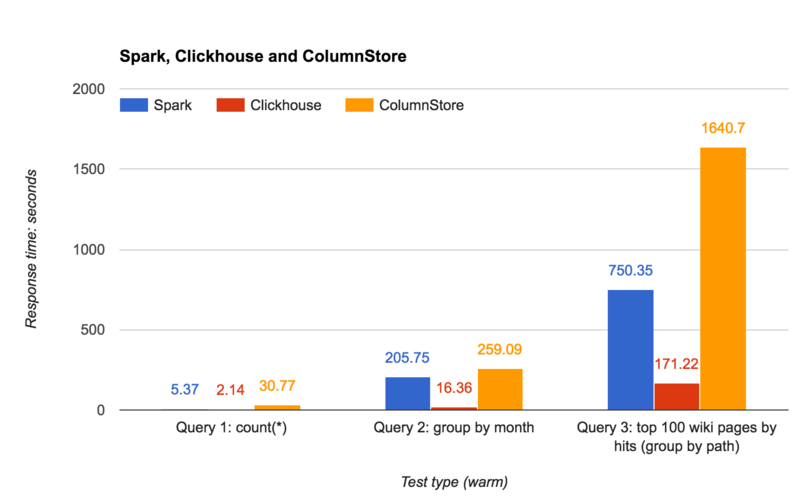 Apache Spark v. 2.1.0, Parquet files and ORC files. Although all of the above solutions can run in a “cluster” mode (with multiple nodes), I’ve only used one server. CPU: physical = 2, cores = 32, virtual = 64, hyperthreading = yes. Disk: Samsung SSD 960 PRO 1TB, NVMe card. 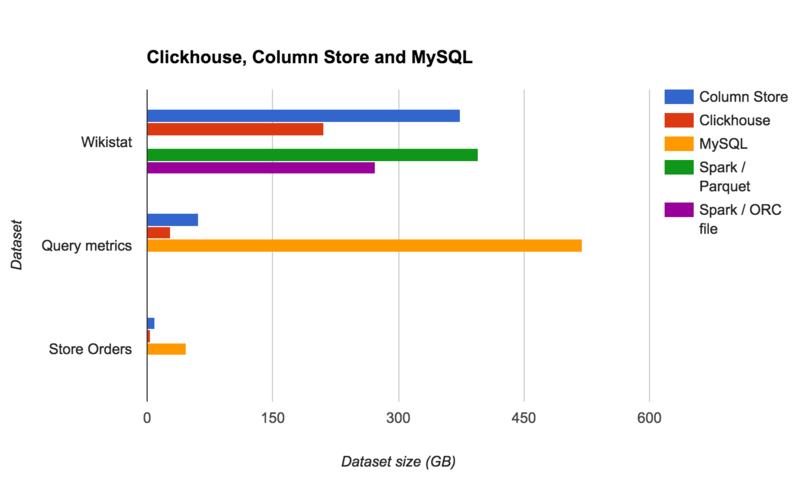 I’ve loaded the above data into ClickHouse, ColumnStore, and MySQL (for MySQL the data included a primary key; Wikistat was not loaded to MySQL due to the size). MySQL tables are InnoDB with a primary key. All of the solutions have the ability to take advantage of data “partitioning” and to only scan needed rows. ClickHouse has “primary keys” (for the MergeTree storage engine) and scans only the needed chunks of data (similar to partition “pruning” in MySQL). No changes to SQL or table definitions are needed when working with ClickHouse. As we can see here, ClickHouse has processed ~2 billion rows for one month of data, and ~23 billion rows for ten months of data. Queries that only select one month of data are much faster. Apache Spark does have partitioning, however. It requires the use of partitioning with parquet format in the table definition. Without declaring partitions, even the modified query (“select count(*), month(date) as mon from wikistat where date between ‘2008-01-01’ and ‘2008-01-31’ group by mon order by mon”) will have to scan all the data. As “path” is actually a URL (without the hostname), it takes a lot of memory to store the intermediate results (hash table) for GROUP BY. ERROR 1815 (HY000): Internal error: IDB-2015: Sorting length exceeded. Session variable max_length_for_sort_data needs to be set higher. Spark does not support UPDATE/DELETE. However, Hive supports ACID transactions with UPDATE and DELETE statements. BEGIN, COMMIT, and ROLLBACK are not yet supported (only the ORC file format is supported). ColumnStore is the only database out of the three that supports a full set of DML and DDL (almost all of the MySQL’s implementation of SQL is supported). Yandex ClickHouse is the winner of this benchmark. It shows both better performance (>10x) and better compression than MariaDB ColumnStore and Apache Spark. If you are looking for the best performance and compression, ClickHouse looks very good. At the same time, ColumnStore provides a MySQL endpoint (MySQL protocol and syntax), so it is a good option if you are migrating from MySQL. Right now, it can’t replicate directly from MySQL but if this option is available in the future we can attach a ColumnStore replication slave to any MySQL master and use the slave for reporting queries (i.e., BI or data science teams can use a ColumnStore database, which is updated very close to real-time).